Flutist Chip Shelton puts the accent on percussion, bringing in three members from The Spirit of Life Ensemble (Greg Buford, Everald Brown, and Daoud David Williams) for this Labor of Love recorded live at New York’s Five Spot. 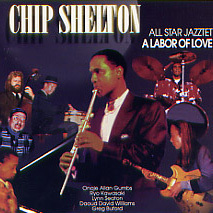 Utilizing a C vertical flute, Shelton pushes Eddie Harris’ “Listen Here” with touches of vocal sounds blending with the instrument. On other tunes, such as “Body and Soul,” Shelton reaches for the mellower tones of the bass flute. Shelton and company move through many rhythms from his own “Samba de Joy” to the funk beat of “Don’t Hop Da Hip,” though with three drummers, guitar, piano and bass, the flutist is occasionally over-powered on this, his debut disc.